The Rocky Horror Picture Show has had a long and glorious (and somewhat sordid) history in Denver since the film's debut in 1975. Older locals still speak with hushed tones and wistful, guilty glances of the debauchery at the old Ogden Theater in the 1970s and 1980s. Rocky became a local institution at the Esquire Theater on 6th Avenue through the 1990s. Started by a few renegade members of Denver's then shadow cast, Denver's Dynamic Tension, Colorado's Elusive Ingredient (CEI) opened at the Esquire on April 15, 2000, where they performed every Saturday night for a brief but memorable run. In February 2001, due to a change in theater management at the Esquire, CEI relocated to the movie theater in the Buckingham Mall in Aurora. CEI moved out in September 2001 and found a warm and happy home at the Tiffany Plaza Mall in Denver, where it remained for just over a year. The Tiffany Plaza remains CEI's most successful run to date, regularly drawing in attendance between 80 and 110 regulars and virgins (people attending a live shadow-casted performance of the Rocky Horror Picture Show for the first time). After CEI parted ways with the Tiffany Plaza, they found a home with the Tivoli Starz Film Center, located on the Auraria Higher Education Campus in downtown Denver, in October 2002. While smaller in size, the Tivoli allowed CEI to perform on a weekly basis with success, completely selling out all available seating on several occasions. Due to differences in opinions of appropriate content of the show between CEI and the owners of the Tivoli Starz Film Center, the Denver Film Society, CEI regrettably parted ways with the Tivoli in March 2005 and searched for a new home. The Oriental Theater in Denver offered CEI a home after multiple special performances there during CEI's tenure with the Tivoli. Being a concert venue, the Oriental provided CEI with more than adequate space to perform every Friday night. Unfortunately, dwindling attendance and theater renovations caused the Oriental to temporarily close its doors, leaving CEI homeless once again in August 2006. After CEI left the Oriental, they experienced a stint of homelessness which resulted in a drop from the public eye and lowered attendance. 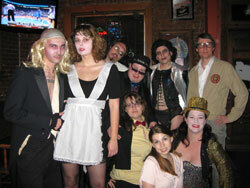 This stint was the first time Denver had ever not had a weekly showing of RHPS since 1975. A home was finally secured at the Crossroads Theater in downtown Denver in October 2006. However, time spent without a regular performance caused a noticeable drop in weekly attendance. After several weeks of performances CEI was starting to build a buzz for the show again; but unfortunately, due to zoning restrictions imposed by the City of Denver, the Crossroads was temporarily shut down in January 2007. CEI management, however, managed to keep strong, positive relations between cast and the theater. After nearly a year of homelessness, performing occasionally with members of the University of Northern Colorado's drama department and at various venues throughout Denver, the newly relocated Crossroads Theater opened its doors for CEI once again. Running from April 23rd to July 7th, 2007, this recently renovated theater provided a comfortable home for CEI for 4 short months. Circumstances outside of CEI's and the Crossroads management's hands caused the cast to become homeless once again. Starting November 2nd, 2007 and running through December 14th, CEI found a home at Red and Jerry's in Sheridan, Colorado. Due to undisclosed issues, CEI temporarily found itself homeless once again. CEI spent the better part of the next year approaching local theaters about hosting them as a weekly show, but it wasn't until late fall of 2008 that cast was introduced to Lannie Garret and her beautiful Clocktower Cabaret. From November 7th, 2008 through February 27th, 2009 CEI performed at the beautiful and historic D&F Clocktower with Lannie's Clocktower Cabaret every Friday night, a shift from their usual Saturday performances. However, due to difficulties in maintaining a large enough audience, primarily because their liquor license required a 21+ crowd, our run had to come to an end. CEI has returned to the Esquire Theatre, premiering with a sell-out show on August 28th, 2009, and turning away more than 150 extra audience members. CEI now performs every last Friday of the month, a strange departure from the weekly shows they were accustomed to, but they are fortunate to be working with a theater manager who understands and appreciates what Rocky Horror brings to the plate. While they will likely remain performing on Friday nights, they hope to increase the number of times per month they perform in the near future. Tickets can be purchased online at LandmarkTheatres.com .